3 Bedroom , 2.5 Bathroom townhouse. Seaside Village on the Pohutukawa Coast. Beachlands Junction Townhouse is a new 2-story home complete with 2.5 bathrooms and 3 bedrooms, all with super king beds that can be split on request. The master room comes with its own en suite with the other 2 bedrooms sharing a large bathroom with a shower, toilet & bath. Downstairs is open plan living including a full kitchen, dining and indoor/outdoor living. A laundry facility and toilet are also found on the lower level. Beachlands is a seaside village on the beautiful Pohutukawa Coast. Come and Relax on our beaches and take in the beautiful views of Rangitoto Island, Waiheki Island, Auckland City & other surrounding Islands. We have safe swimming beaches, coastal walks, bush walks and great fishing spots. 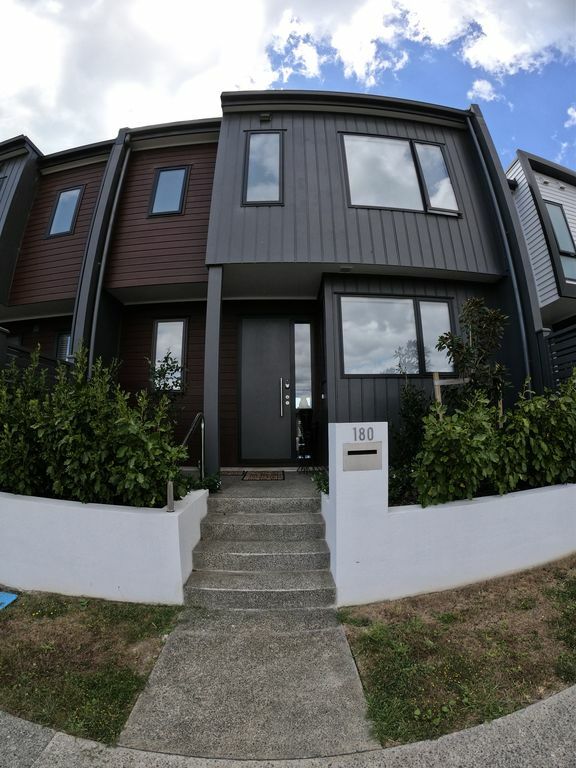 Beachlands Junction Townhouse is a min walk to the Pohutukawa coast shopping centre which is a small complex complete with a Countdown Supermarket, The Franklin Restaurant & Bar, takeaways, medical centre, chemist, hairdresser, barber, alcohol store, beauty salon plus much more. A 3-minute drive will take you to Pine Harbour Marina, which is our Gateway to the Hauraki Golf. A 35-minute ferry service operates Monday to Friday taking you to Auckland CBD. Pine Harbour also has Pepperjacks Restaurant & Bar and Kaiseki Japanese restaurant and a seasonal French market which overlooks the Marina. A 2-minute drive will take you to Formosa Golf Resort or a 10-minute drive to Whitford Park Golf club. Additional services such as the local shuttle can be arranged to pick you up from Auckland Airport or any other event you may be attending during your stay such as a sporting event, concerts, wedding, family outing or maybe you would just like to explore the area. Babysitting services can also be arranged on request - Charges approx. $15-$25 per hour. Local Allfit Gym at additional charges. Smoke Alarm & Carbon Monoxide alarm on premises (no gas appliances). Beachlands is a Seaside Village on the beautiful Pohutukawa coast. Nearby Formosa & Whitford Park Golf courses, Pine Harbour Marina, beautiful Beaches. Clothes Line & Clothes Airer available only. On Street Parking outside Front Door and Carport space available down laneway at the back. Allfit Gym open 24 hours - Fee applies. Formosa Golf Course is a 2 min Drive or 15 min walk. Whitford Park Golf Course, 10 min drive. Babysitting by request at Additional cost of approx $15-25 NZD per hour. Boating - Pine Harbour Marina, Maraetai Beach Boat Club, Beachlands Boat Club. All within 5 mins. A Security Alarm/camera with door sensors are located in the Lounge. This system is disconnected . Any other requests please ask. Carol went above and beyond to make sure our stay was perfect. We were travelling with a new born. She arranged a Moses basket, new linen, new baby bath, change mat, baby toiletries, toys for my eldest and snacks too! Never in my life have I felt so looked after- we want to go on another holiday back here because it was so easy! Thank you Carol- we wish you all the best and hope to see you again soon. Super clean and well equipped! Overall this is a super place to stay. Clear instuctions on how everything works. Thanks team. A great stay and very comfortable property. We thouroughly enjoyed our stay at this property. We were in Beachlands for a family wedding. Everything was so well thought out with unexpected extras such as juice and cereal for breakfast. We were close to supermarket and cafes for coffee and restaurants. Very quiet clean and modern and lovely comfortable beds with quality linen. Would definitely stay again and recommend to anyone wanting a superior holiday experience. Thank you for the best stay. Thank you Shona for your review. It was a pleasure having you and your guests stay and thank you for leaving everything tidy. The weather was perfect for your Brothers Wedding. Hope to welcome you back in the New Year sometime. Beachlands - Pohutukawa Coast is a Seaside Village. Great Beaches, Coastal Walks, Cycle Tracks, 35 min Ferry ride to CBD Auckland and see sights of Rangitoto Island, Waiheki Island, Devonport, Coromandel , Tiritiri Matangi Island just to name a few.